Heating of steel and then air cooling at room temperature on a nonreactive surface. This provides a slow cooling of the metal. Annealing is similar to normalizing except the metal is put into a medium that allows cooling to occur at a slower pace. Some suggestions for the medium are vermiculite, wood ash, or lime. The purpose in annealing is to reduce the internal stress in metal and soften it for further processing. 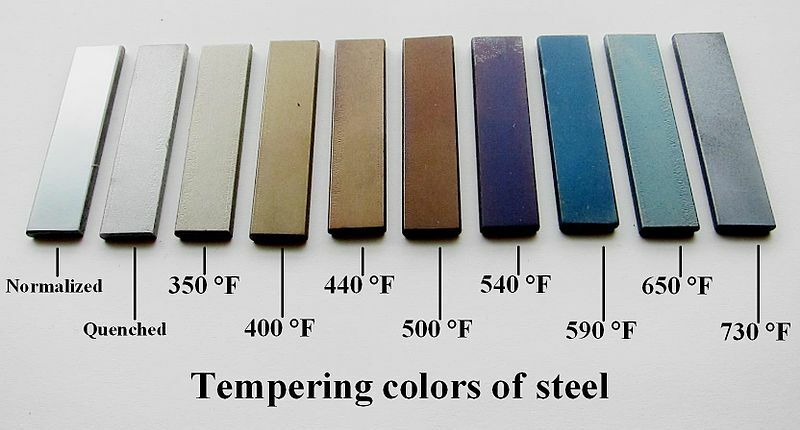 Steel is "hardened" by heating it to a cherry red and then quenching it in a liquid. The most common cooling mediums are water, salt water, and oil. There are also some surfactant based mediums that are used such as "super quench". Quenching is the act of rapidly cooling the hot steel to harden the steel. Quenches are usually done to room temperature. Most medium carbon steels and low alloy steels undergo transformation to 100% Martensite at room temperature. However, high carbon and high alloy steels have retained Austenite at room temperature. To eliminate retained Austenite, the quench temperature has to be lowered. This is the reason to use cryogenic quenching. Water: Quenching can be done by plunging the hot steel in water. The water adjacent to the hot steel vaporizes, and there is no direct contact of the water with the steel. This slows down cooling until the bubbles break and allow water contact with the hot steel. As the water contacts and boils, a great amount of heat is removed from the steel. With good agitation, bubbles can be prevented from sticking to the steel, and thereby prevent soft spots. Water is a good rapid quenching medium, provided good agitation is done. However, water is corrosive with steel, and the rapid cooling can sometimes cause distortion or cracking. Salt Water: Salt water is a more rapid quench medium than plain water because the bubbles are broken easily and allow for rapid cooling of the part. However, salt water is even more corrosive than plain water, and hence must be rinsed off immediately. Oil: Oil is used when a slower cooling rate is desired. Since oil has a very high boiling point, the transition from start of Martensite formation to the finish is slow and this reduces the likelihood of cracking. Oil quenching results in fumes, spills, and sometimes a fire hazard. Polymer quench: Polymer quenches that will produce a cooling rate in between water and oil. The cooling rate can be altered by varying the components in the mixture-as these are composed of water and some glycol polymers. Polymer quenches are capable of producing repeatable results with less corrosion than water and less of a fire hazard than oil. But, these repeatable results are possible only with constant monitoring of the chemistry. Cryogenic Quench: Cryogenics or deep freezing is done to make sure there is no retained Austenite during quenching. The amount of Martensite formed at quenching is a function of the lowest temperature encountered. At any given temperature of quenching there is a certain amount of Martensite and the balance is untransformed Austenite. This untransformed Austenite is very brittle and can cause loss of strength or hardness, dimensional instability, or cracking. Surfactant-based Quenching Medium - Robb Gunter's "Super Quench"
Simple Green (enough for 5 gallon mix). Available at Wally World. Jet-Dry "liquid rinse agent". Use the UNSCENTED 7oz bottle. The Jet-Dry (or whatever you use for a rinse agent) does something chemically to the surface of the steel. It allows the salt in the mix to start attacking it as soon as it hits the air - make sure you have a LOT of clear water to rinse in ready at hand. These surfacants are wetting agents. They break down the surface tension of water allowing it to make contact with a material. We've all dipped a cold piece of metal in water and seen a bubble-like "skin" form with dry metal under it. This is surface tension trapping a layer of air, it makes a fair heat shield. In a quench, steam will form a similar surface "skin" and prevent full contact with the water, insulating the steel from a proper chill. Wetting agents prevent the "skin" from forming. Detergents do a somewhat similar job, they're emulsifiers allowing oils and water to mix. This prevents any oily residues from the fire from forming a "heat shield" surface layer. The salt in the water raises the specific heat of the water and draws the heat from the steel faster. Stir it up to get it moving before you quench. Don't quench anything with more than 45- 50 points of carbon. Will harden mild steel to Rockwell 42-45 (in spite of common wisdom that says you can't harden mild steel). It's color coded - when you've exhausted the usefulness of the quench, it'll shift color from blue to green.